The Kinniya Divisional Secretariat division in the Trincomalee District located along the Eastern coastal belt has a cause for celebration - Sri Lanka's longest bridge constructed across the Kinniya bay connecting Wellaimanal and Kinniya is the Kinniya bridge. In operation for over one year, the bridge has proved to be a lifeline for the people in the East. Sri Lanka's longest bridge constructed in fulfilment of the concept of the "Mahinda Chinthanaya" with financial assistance provided by the Kingdom of Saudi Arabia when Senior Presidential Advisor and Present Economic Development Minister Basil Rajapaksa, was a parliamentarian was opened by President Mahinda Rajapaksa on October 20, 2009 on an invitation extended by Highways Minister T.B. 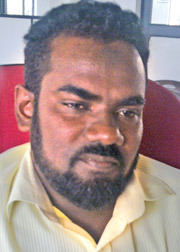 Ekanayake. As the transport issue of this area was solved domestic industries in the area have been revived. It has also become a boon to the tourism sector, both domestic and foreign. According to rough estimates of the Kinniya Divisional Secretariat, nearly 50,000 domestic tourists have visited the bridge last year. The people are engaged in handicraft industry with the arrival of tourists. According to the sources of Kinniya Divisional Secretariat certain houses have been converted into guest houses to provide accommodation to tourists. Even-though the bridge is a gateway for economic prosperity of the area, it has caused concern in certain other ways, said M.M. 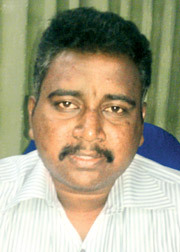 Baseer, Secretary, Kinniya Urban Council. He further said that certain areas that reman in darkness are misused by lovers during the night. "Certain children's parks have also become the asylum of lovers during night. The bridge has contributed to the economy of the area on a huge scale. These activities were not seen before the opening of the bridge. The police have brought this to the notice of the authorities. The Kinniya Urban Council also decided to install lighting in these areas. Before the bridge was built, construction activities in this area took place amidst immense difficulties. There was little access for heavy vehicles. It took a long time to come through alternative routes. The Thambalagamuwa main road was in a dilapidated condition. Kinniya was virtually separated from other parts of the District. Due to the unavailability of resources and poor communication with other areas the economy of this area was crippled. The Kinniya Divisional Secretary M.M. Mubarak said that economically a huge change had taken place in the area. Raw materials are brought on time and the harvest reaches the market without perishing. Government servants who are employed in Trincomalee city benefit immensely. Government servants earlier spent a long time waiting for ferry boats. Now they could cut down on additional expenditure after the opening of the bridge. Those wishing to cross the lagoon had to wait for more than one and a half hours at the jetty waiting for the ferry boat. Now people are able to cross the Kinniya bay via the new bridge in minutes. Prior to the erection of the bridge it took nearly three hours to get to Trincomalee. According to the Assistant Divisional Secretary C. Krishnendran, people in Kinniya experienced untold hardships due to the old ferry boat service. There were a lot of deficiencies in the service. There were only two ferry boats but sometimes only one was in operation. This was the only transport mode for nearly 80,000 people in the Kinniya area. The small ferries could accommodate only a few passengers. The journey on a ferry was a journey between life and death. When vehicles were transported several vehicles had fallen into the lagoon from the ferries. Only 60 to 70 persons can be accommodated on board the ferry. This number decreases when vehicles are accommodated on board. Then only 20 to 30 foot passengers can be accommodated on board. As the price of fuel and spare parts went up, the Road Development Authority restricted the number of ferry journeys per day. With the opening of the bridge the expenditure of the RDA has reduced. A large number of vehicles loaded with vegetables and other produce ply via the Kinniya bridge to Trincomalee and other parts of the District. As Kinniya is located close to the lagoon there are abundant aquatic resources. On the other hand as Kinniya is located close to Mahaweli river there are enough facilities to uplift agricultural activities in this area. The construction of the bridge can be considered as the gateway for the advancement of agriculture in this area. According to Mubarak there are enough aquatic resources even for export. A large number of Kinniya residents are engaged in mining sea shells. A person earns more than Rs. 2000 daily through selling sea shells to dealers. A large number of businessmen are engaged in transporting sea shells to other parts of the country from Kinniya. The fish caught in the Kinniya sea area is being transported to Colombo and other parts of the country daily via the Kinniya bridge. Opportunities have arisen for entrepreneurs from grassroots level to top level to strengthen their businesses. 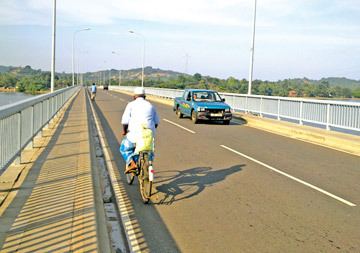 Nearly 200 vegetable sellers use the bridge daily to take their produce to Trincomalee and other parts of the country. The handicraft industry has also received a boost in this area. People who travel to Seruwila and Muttur now use the Kinniya route. Prior to the floods, people used this route to go to Batticaloa and Ampara. Through the journey via Kinniya passengers can save more than three hours of their entire travel time.